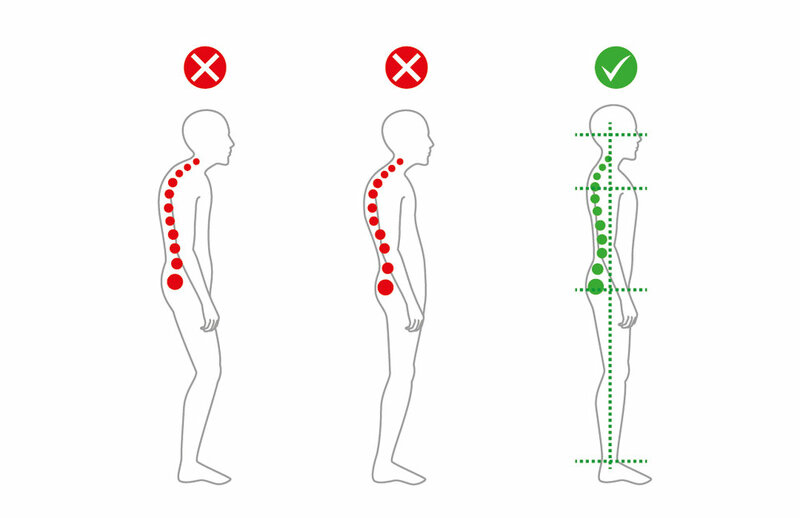 Our occupation and our increasingly sedentary lifestyles can lead to back pain because of poor posture. If it continues it can lead to longer term problems later in life, so it’s beneficial to know what good posture looks like. Your ear, shoulder, hip and ankle should be in a line. Stand tall with your back and head against the wall. That’s good standing posture. Make sure you sit with your bum against the back of the chair (BBC). Feet should be flat on the floor. Arms parallel to the floor. The top of your screen should be at eye level. Your spine should be straight when lying on your side. If you sleep on your back, put a pillow under your knees. Your bed should allow you to have a straight spine if lying on your side – soft enough to accommodate the curves of your shoulder and hip.